We have long loved the effects of what risograph can achieve. The imperfections, the gradients, the opacity, the overlaps - love! We have used it for packaging design for our Stationery Gift Boxes for the belly bands and the box liners. When printing with Risograph (or riso), one of the favourite things we love, apart from the process, the changing of drums (yup we have done it), making the masters, and the effects it can achieve; are the colour charts that each printer would produce. These colour charts are useful pieces of information from the printers to show the riso colours they have in stock, and also serve as a guide for designers as a source of inspiration on how to set their gradients, line weights, font size etc. It is one of those pieces of paper that definitely tops a colour lover’s hoard list (yes us! ), which Marie Kondo may not approve. Hey Marie, if you are reading, we do thank these Riso charts for their service, so, here we are keeping them in digital for now. This is a super fun animated risograph colour chart from Popurri, a risograph studio in Seoul, Korea. We love cute gifs. To make a colour chart with a combination of super quirky illustrations and animate it, this is totally rad! We particularly love the playful messages in the colour chart “I Need A Friend”, and “Draw His New Friend” - that makes our hearts melt, super adorbs. This clear, precise and simple risograph colour chart shows brilliant examples on colours available by print studio InkChaCha in Hong Kong. This colour guide shows the different effects that can be achieved from riso printing, from swatch samples of matching colour gradients, overlapping different riso colour shades, to brush strokes effects. 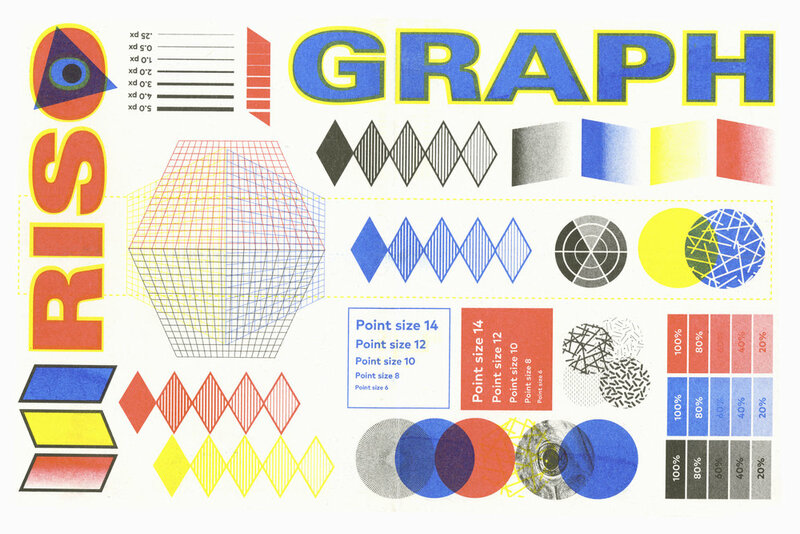 One of the most comprehensive and detailed colour charts we have come across that works great as a neat reference guide to Risograph printing. Yup, we have a copy of it in the studio and it is definitely one of the items on our hoard list which we will never be able to part with. Paper Pusher Printworks is a print studio in Toronto, Canada which is the brainchild of artist / designer J P King. They have produced a really cool and one of the most delicious Risograph chart that is as yum as looking at delicious Pâte de Fruits jelly cubes. This beautiful colour chart not only depicts the risograph colours that are available in the studio but also cleverly shows on the same axis how you can mix and match to create new colour shades, that are not offered as standard risograph shades by overprinting 2 or more colours. P.S If you are veg lovers like us, note, the type examples in this colour chart is bursting with deliciousness. 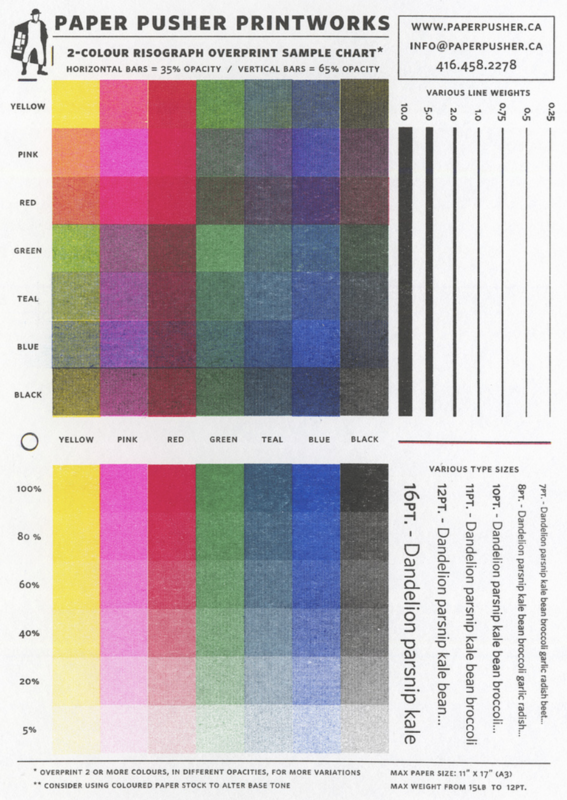 This risograph colour chart from printing cooperation Calverts CoOp in London is a colour chart for graphic design lovers. The colour chart in itself is a piece of brilliant graphic art that encompasses typography, shading, patterns, gradients. It also has a slant of Piet Mondrian in it, less cubism more graphical, with the red, blue, black and yellow colour scheme. Super cool! Apart from this overview colour chart, for each individual colours, they have taken the trouble to show each individual colour they have in stock along with the different effects that can be achieved by changing around the opacity which could be seen via this link. PauseBread is a riso studio in Shanghai, China. It is both a printing studio, as well as a publisher that publishes its own work and collaborations under the name Banana Fish Books. We love the example of the vibrant colour chart that they have on display on their risograph splash page in their website. It beautifully captures the title of the page “Beauty of Risograph” and something we can resonate with. It’s a lovely colour chart example where they have displayed the colour chart like a piano keyboard; accompanied by details to demonstrate the effects that can be achieved by risograph printing. From depicting the different opacity with the use of a manuscript; highlighting different qualities such as the granular texture that risograph can offer, along with cute graphic footnotes. A very well composed, and a very sweet colour chart - a true beaut and a lovely tune we want to tune into. (Pun intended).